HP Prime Graphing Calculator comes with a feature-rich calculating experience with familiar HP keypad and a large 3.5-inch diagonal, multi-touch display. The HP Prime has a compelling industrial design, innovative color, sleek, brushed metal and a reliable HP key design and feel. Powerful functionality, Symbolic/Algebraic/Numeric views, Dynamic Geometry, Computer Algebra System (CAS), HP Solve and Equation Writer, Test mode configuration, HP Calculator Connectivity Kit. Harness HP Prime's powerful functionality for your secondary and university level classes with applications including: Advanced Graphing - Graph virtual anything on X & Y, Dynamic Geometry - View and edit symbolic definitions of all geometric objects and Statistics Package - Equipped with one-variable, two-variable and inferential statistics. HP Prime is the ideal for: Pre Algebra, Algebra 1 & 2, Linear Algebra, Pre Calculus and Calculus & AP Calculus. HP Prime has been Exam Approved: SAT® College Admission Exam, SAT Subject Tests™ in Mathematics, AP® Advanced Placement Exams, PSAT/ NMSQT® Preliminary SAT National Merit Scholarship Qualifying Test, IB® International Baccalaureate Organization Diploma Programme. HP Prime CPU: 400 MHz ARM with 32 MB memory and 256 MB flash memory. HP Prime TFT Display: 320 x 240 True Color Touch Screen (10 lines x 33 characters). HP Prime Entry System Logic: HP RPN, Algebraic and Textbook entry mode. HP Prime Keyboard: Alphanumeric which includes selected scientific notations. HP Prime Power System: Lithium-ion rechargeable battery with built-in intelligent power management and auto 5 minutes auto power off. 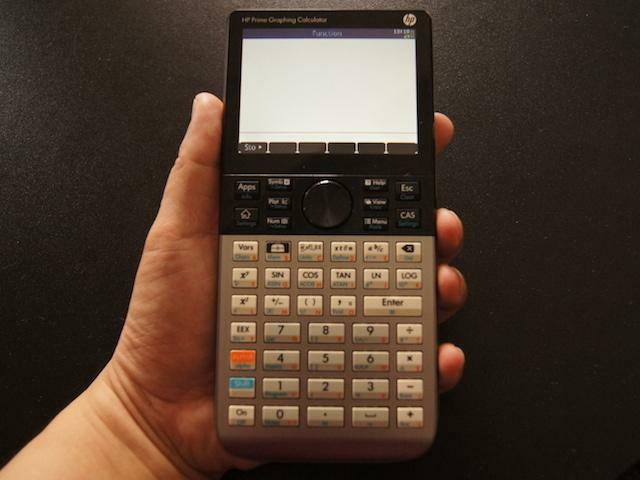 HP Prime included software: Virtual calculator and software included to transfer work between calculator and PC. What's in the box? Calculator with Hard Cover, Quick Start Guide, CD, USB cable and Universal power supply. Hello, bought my HP Prime yesterday and learning how to use it. Downloaded some progs which run ok in the virtual calculator but not on the Prime. not even a week yet... the screen is flickering constantly (I tried ON+Symbol# also reseting it did not fix the problem) I don&apos;t want to return it. help?? I bought a HP PRIME , but I can not put more than three or four files in it , it tells memory. But it has 32MB of memory and 256MB of flash memory. Can anyone help me ? How do I use the memory of it? I&apos;d like to know where I can buy the HP prime calculator in Singapore. Hi. The new shipment of HP Prime (aka V2) has just arrived and it is now available at Inforcom and Prestige (downtown). V2 supports touch pinching action to zoom in and out graphing plot. Hi Dan. The HP/Educalc Team will be visiting Manila sometime in August 2014. Do let us know if you would still like more information regarding the HP Prime.